Here are some recent projects from the Barkwhistle Wood Shop, while we wait for the Winter That Never Ends to, um, end. Outdoor projects await! 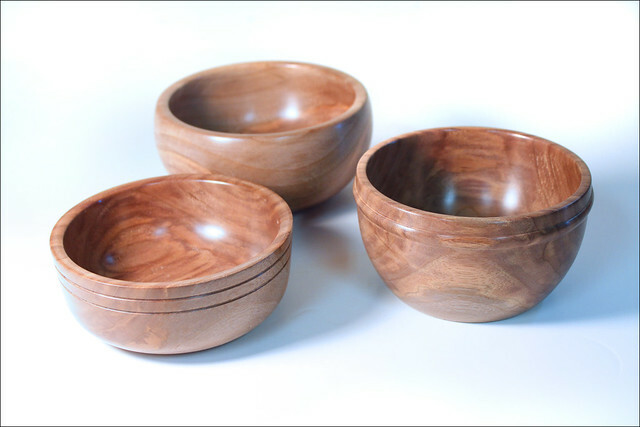 Three Walnut Bowls. 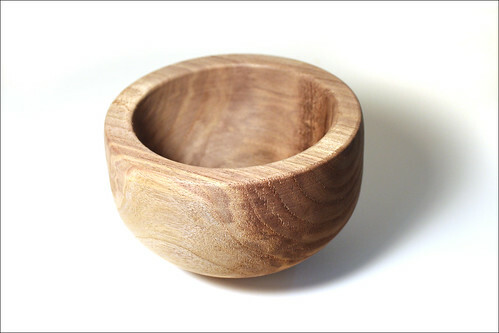 One of these we saw in the previous post, A Simple Walnut Bowl. 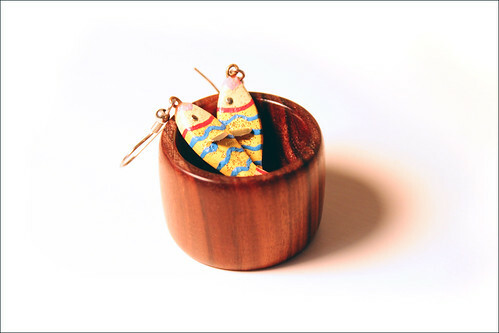 The other two are just slightly less simple, so I simply call them bowls. Salt Grinder. Could be called a pepper grinder or spice grinder, but currently it has hot spicy salt in it. Yum. The chrome handle is new; previous grinders had the black handles (e.g. 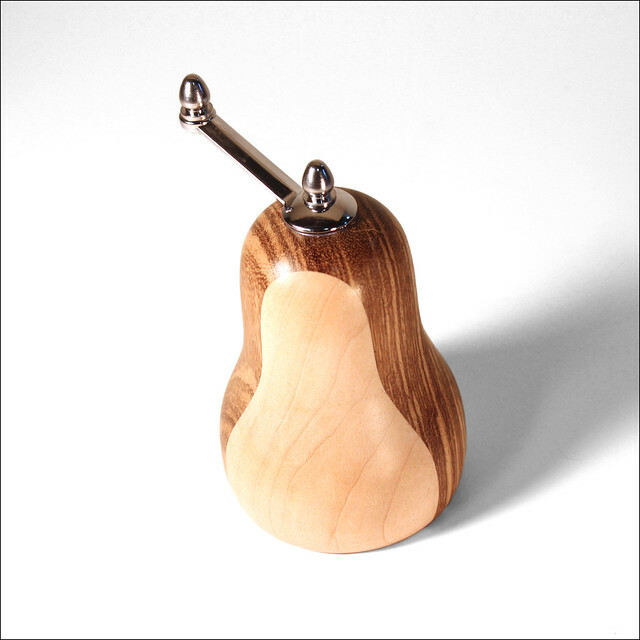 these Lacewood Grinders), but I thought I’d do some chrome ones for a change, maybe make salt and pepper matching sets with chrome and black handles to tell the salt from the pepper. 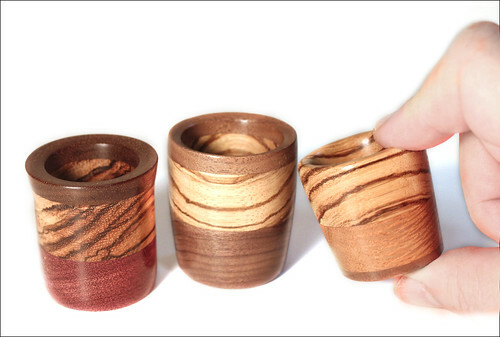 The wood here is zebrawood in a maple sandwich. 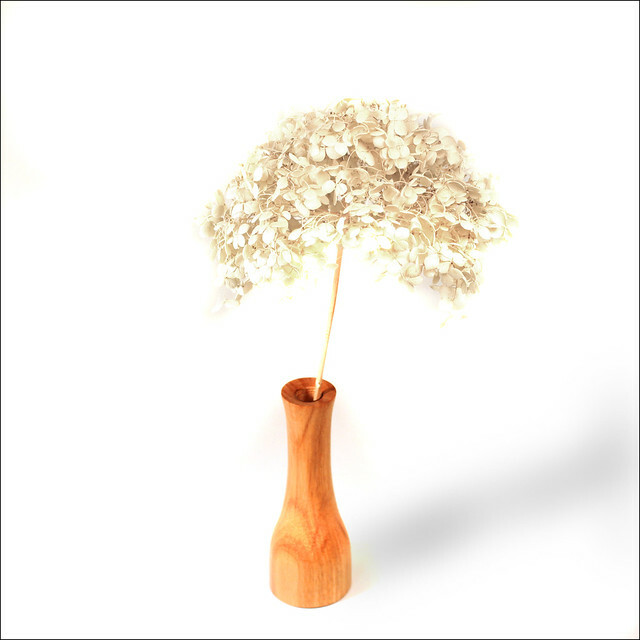 Canarywood Vase. I still have a whack of test tubes for bud vases, so these will appear from time to time. This is canarywood. I’ll probably do some laminating soon, make some slightly bigger ones. That’s it for now, still waiting for the snow to melt so we can get on with rebuilding the grape arbour. 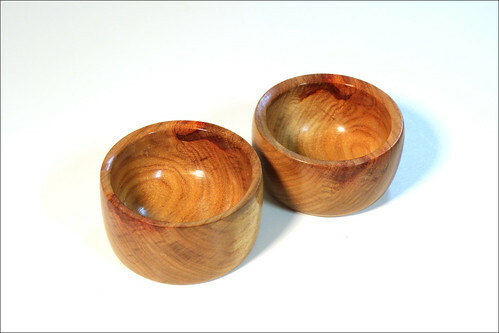 A while back, very early in the new year, I rough-turned some walnut bowls from a tree that came down last summer. The rough bowls have been sitting for about 10 weeks, so I figured it was time to give it a whirl, so to speak. 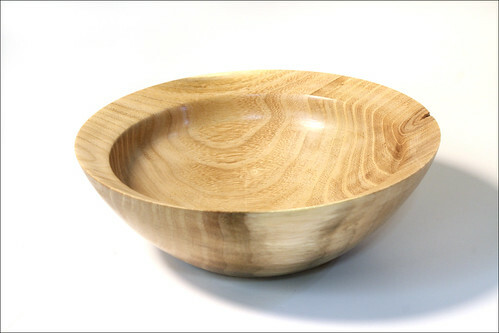 It’s a decent size bowl for my lathe, just under six inches. So I’ve been puttering about in the shop, as one does, gravitating towards the lathe and smaller projects (tiny little attention span). 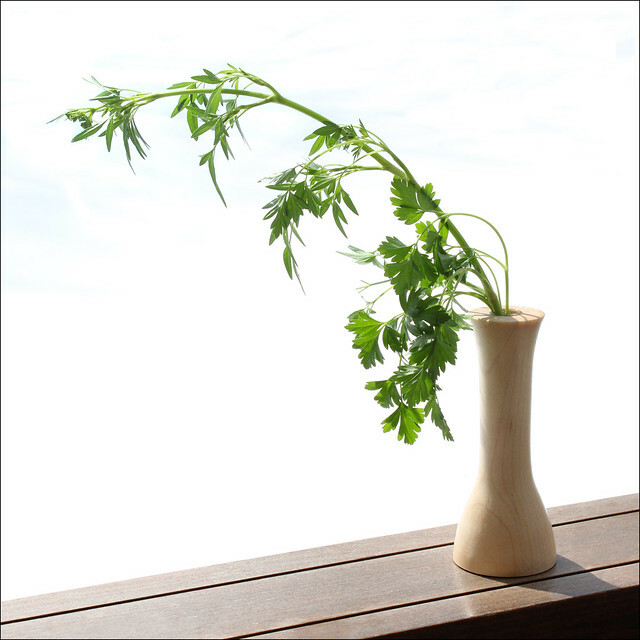 First up, and most recent, is this prototype of a bud vase, made from maple. I thought I’d test the process before I break out the fancy schmancy wood, although the understated elegance of maple is not misplaced here. I think it does need to be a wee bit taller though. 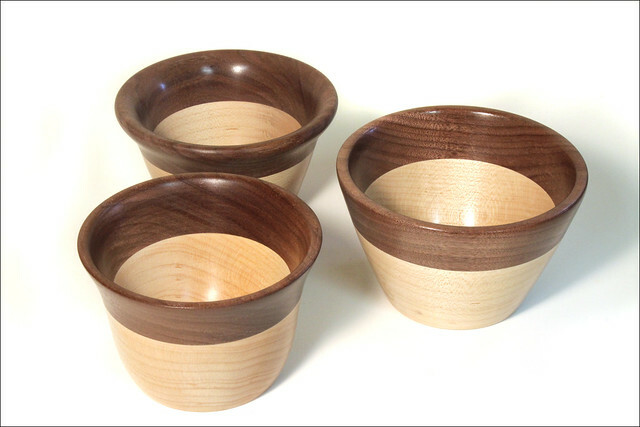 Before the bud vase, I made these three small (about four and a half inches) maple and walnut bowls. I laminated the maple and walnut boards, then cut them into three equal pieces to form the blanks. They’re not meant to be a matching set, I was trying out different thicknesses and shapes. 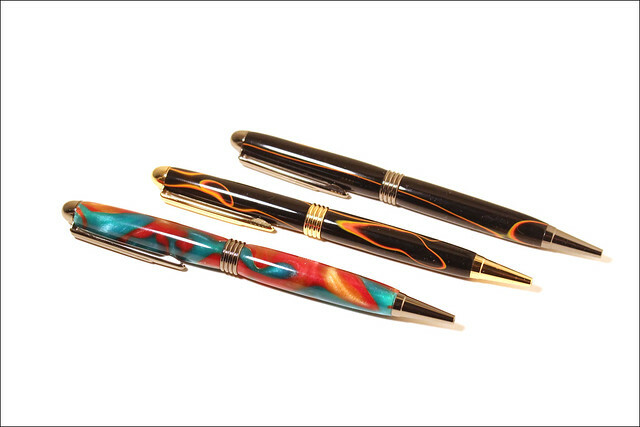 Lastly, and least recently, a trio of acrylic pens. I love the names of the acrylic blanks, despite being a bit of a pain to turn. Two of these are called “Harley Flame” and the other is “Licorice Allsorts”. They are “Streamline” pen kits. I thought I would kick off the new year by starting in on one of the chunks of black walnut that came my way during the summer. At that time, we chunked it up into manageable pieces with the chain saw. I then took one of those pieces and got four small slabs out of it, each about 8 inches square by about 4 inches thick. Today I took one of those small slabs, drew a circle on it and cut it roughly to that circle shape on the bandsaw. Next I screwed on a mounting plate and turned it to round, adding a small tenon on what will be the bottom of the bowl. 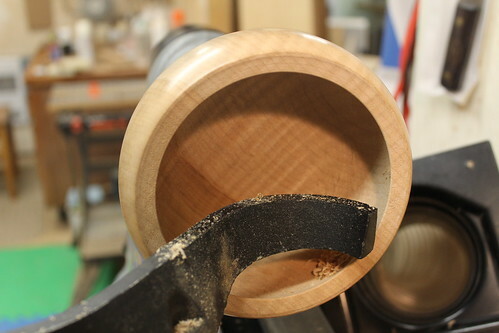 I chucked up the tenon, then removed the mounting plate and reversed the bowl, hollowing out the interior. I took it deep enough to leave about an inch at the bottom, not counting the tenon, and about 3/4 of an inch on the sides. This is as far as I will take it for now. 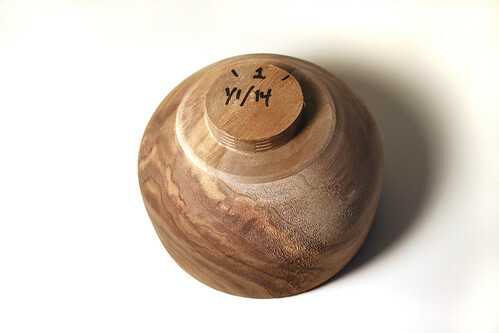 I wrote the date on the tenon (this part will not be on the final bowl) and marked the location of the #1 chuck jaw, so I can get it as close as possible to running true the next time I mount it. The next step is to re-coat the piece with the same wax coating it had six months ago, then wait another six months before finishing the turning. This long time-frame is a challenge for my tiny attention span, but I’ll turn some pens or something in between to keep myself amused. 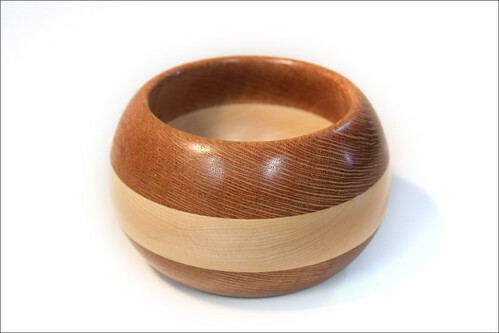 I finally finished this simple wooden bowl, made from a figured maple bowl blank I had lying around for a while. I took my time with it, since it’s pretty big for my little lathe, and I didn’t want any drama. The only drama was when my paper towel got sucked up into the dust collector. Twice. But that’s easily fixed. 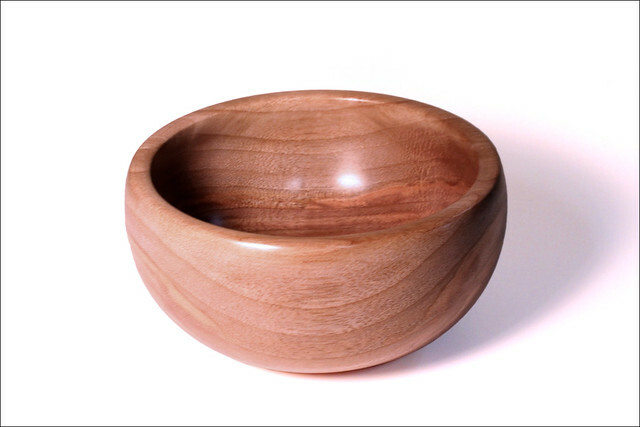 The bowl is about 6 inches in diameter and 3 inches tall. Finished with EEE Ultra Shine and Shellawax. I thought I would grab some photos of this bowl-in-progress today, in case something goes horribly wrong tomorrow. Woodworking can break your heart — it’s best to be prepared for the worst. It just makes success that much sweeter! The outside is fully shaped and has a first coat of finish on it. In the picture below you can see I added a couple of detail rings on the bottom which nobody will ever see, but I’ll know they’re there. 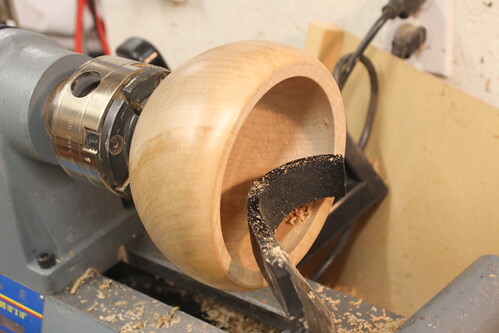 The S-shaped tool rest allows me to get in closer to the inside of the bowl. I’m using mostly the Easy Wood Tools Finisher because I love the carbide cutters. 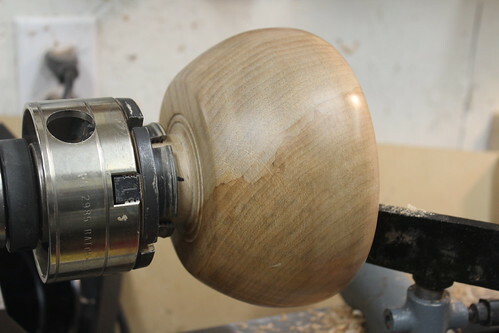 I went back to a bowl gouge briefly and it felt scary and unpredictable by comparison. No looking back now. I’m at that delicate stage in the process where you have to find the compromise between making the bowl thin and delicate vs. staying safe and not risking all that’s been invested. I figure I have a little ways to go yet, it still feels a bit clunky to my hand, and it feels like a stable enough piece of maple, despite some nice figure, that I can take it a bit further. Fingers crossed. Canarywood Bowls, originally uploaded by rgdaniel. Just finished this almost-matched set of canarywood bowls, about three and a half inches across. Bowl From 2009, originally uploaded by rgdaniel. In November 2009 I took some private instruction on the lathe from local wood turner Larry Cluchey. 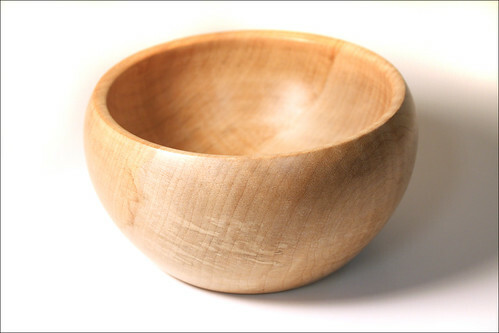 I started a bowl from green wood that day, then sealed it up and put it away for "a few months" to wait for it to dry. Today I dug it out and finished it. I don’t recall what type of wood this is, but it would have been something from his property, nothing exotic.